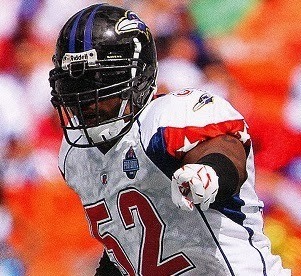 On Saturday, February 9, 2002 the NFL’s top players came together in the AFC-NFC Pro Bowl. The coaches were Pittsburgh’s Bill Cowher for the AFC and Andy Reid of the Eagles for the NFC, whose teams had lost at the conference championship level in the playoffs. The patriotically-themed opening ceremony featured a bald eagle flying through the stadium and a squadron of F-15s soaring over it. The previous day had been marked by heavy rain that forced both teams to cancel practice, but it was 74 degrees and sunny for the opening kickoff with a sellout crowd of 50,301 at Aloha Stadium. It was the 23rd consecutive year in which the contest was held in Honolulu. 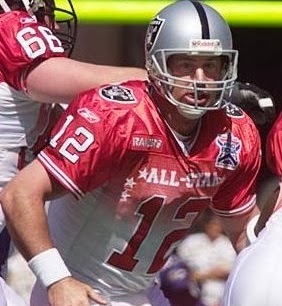 The NFC scored in record time, after Oakland QB Rich Gannon (pictured above) fumbled on the first play from scrimmage as he attempted to pitch the ball to RB Curtis Martin of the Jets. Philadelphia DE Hugh Douglas recovered to give the NFC the ball at the two yard line. From there, RB Ahman Green of the Packers went in for a touchdown with just 27 seconds expired. David Akers of the Eagles added the extra point. Following a three-and-out series by the AFC, the NFC was ahead by 10-0 after Akers kicked a 29-yard field goal that was set up by St. Louis QB Kurt Warner’s completion to Arizona WR David Boston that covered 23 yards. However, Gannon and the AFC caught fire at that point. Two plays later, Gannon threw to WR Marvin Harrison of the Colts for a 55-yard touchdown, beating Tampa Bay CB Ronde Barber. Denver’s Jason Elam added the PAT to narrow the score to 10-7. The AFC took the lead after CB Deltha O’Neal of the Broncos intercepted a pass that he returned 24 yards to the NFC six, which set up a four-yard touchdown carry by RB Curtis Martin of the Jets. Elam’s extra point made the tally 14-10. The NFC had a short series and punted, and the AFC needed just five plays to score again. Gannon threw a flea-flicker pass to WR Troy Brown of the Patriots that was wobbly and badly underthrown, but Brown made the catch for a 30-yard gain. Kansas City RB Priest Holmes finished off the possession by running 39 yards for a TD and Elam again booted the extra point. The NFC put together a 10-play series that ended with Akers kicking a field goal from 41 yards on the last play of the eventful opening period. The teams had combined for a Pro Bowl-record 34 points in the first quarter, with the AFC leading by 21-13. The ensuing kickoff was returned 54 yards by WR Jermaine Lewis of the Ravens, and that set up another scoring series. Gannon threw his second touchdown pass, this one to Indianapolis TE Ken Dilger from 19 yards out over a leaping LB LaVar Arrington of the Redskins. Gannon called it a day with the AFC up by 28-13. That was it for the first half scoring until Akers booted his third field goal with six seconds remaining in the half to make the score 28-16 at the intermission. Early in the fourth quarter, the NFC drove into AFC territory, but Philadelphia QB Donovan McNabb was picked off by San Diego LB Junior Seau. However, CB Champ Bailey of the Redskins returned the favor, intercepting a pass by New England’s Tom Brady that allowed the NFC to narrow the margin to 28-23 in the third quarter when McNabb threw to WR Terrell Owens of the 49ers for an eight-yard TD and Akers added the extra point. The AFC came back with a drive that featured runs by Cincinnati RB Corey Dillon of 29 and 16 yards and was capped by Elam kicking a 38-yard field goal. Two plays later, with 2:49 left on the clock, CB Ty Law of the champion Patriots intercepted a McNabb throw and ran it 31 yards before tossing a lateral to Ravens LB Ray Lewis (pictured below), who went the last 13 yards for a touchdown, dragging three NFC players into the end zone. The NFC scored once more in the last two minutes as McNabb connected with San Francisco RB Garrison Hearst for a 15-yard touchdown. The NFC attempted an onside kick, but safety Rod Woodson of the Ravens recovered for the AFC to end the threat. The AFC won by a final score of 38-30. The AFC had more total yards (398 to 346) although the NFC had the edge in first downs (23 to 19). The AFC gained 201 yards on the ground, to 197 through the air, while the NFC, playing from behind for most of the contest, ran the ball only 12 times for 36 yards and had 310 passing yards. The AFC recorded two sacks and consistently maintained pressure on the three NFC quarterbacks. The NFC also turned the ball over four times, to two turnovers by the AFC. After a rocky start, Rich Gannon completed 8 of 10 passes for 137 yards and two touchdowns with no interceptions, and was named MVP for the second straight year. Pittsburgh’s Kordell Stewart was 6 of 12 for 45 yards and Tom Brady, who entered the game in the fourth quarter, was successful on two of five throws for 22 yards with one interception. Priest Holmes was the leading rusher with 77 yards on 7 carries that included a TD and Corey Dillon contributed 58 yards on six attempts. Marvin Harrison was the AFC’s top receiver with four catches for 80 yards and the one long touchdown. Shane Lechler of the Raiders had punts of 70 and 73 yards, the two longest in Pro Bowl history. For the NFC, Donovan McNabb completed 12 of 25 passes for 149 yards and a touchdown but also was intercepted twice. McNabb also tied for the team rushing lead with one 12-yard carry while RB Marshall Faulk of the Rams also gained 12 yards, on five rushing attempts. QB Jeff Garcia of the 49ers was successful on 11 of 19 throws for 111 yards and Kurt Warner, who started the game, went 6 of 14 for 63 yards with one interception. Terrell Owens topped the receivers with 8 catches for 122 yards. David Akers kicked three field goals, but his try from 62 yards in the fourth quarter fell short. Gannon was playing in his third straight Pro Bowl, a streak that would reach four following the 2002 season. It was the fifth win in the last six games for the AFC, tying the series since the contest had moved to the AFC/NFC format at 16 wins apiece.